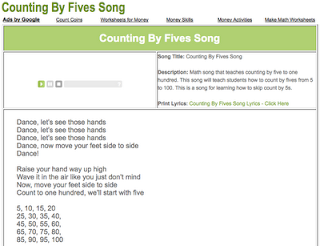 The new Counting By Fives Song is a HUGE hit! Kids love this song and are learning how to count by fives all the way to one hundred. This math counting song has a great beat and makes it fun to sing, dance, and count by fives. Another great resource for teaching how to count by fives is the Reese's Pieces Count By Fives book by Jerry Pallotta.